Investing in a portable outdoor heater is an excellent way to extend the warm weather of summer well into the colder winter months. When you're making your investment, you, of course, want a high-quality heater that will work when you need it to and withstand harsh outdoor elements. To achieve both of these goals, you need to choose carefully when considering the finish you want the heater to have. Fortunately, when you invest in a heater carried by AEI, you can rest easy knowing it has been specially designed to be weather resistant. For now, let's take a close look at the various finishes you can choose from as well as what makes a portable heater worth investing in. What Makes a Heater Worth Investing In? AEI heaters are composed of major components and fasteners that are made from commercial grade aluminum, stainless steel, aluminized steel, or brass. And over the years, the manufacturing process has been intricately refined, which has enabled AEI to manufacture the best heaters available on the market. AEI doesn't believe in taking shortcuts and strives to deliver the first-class heaters at an affordable price. When you purchase an AEI heater, you can rest assured it has been designed to withstand the elements, and while you shouldn't operate the heaters in heavy rain, they are resistant to water and sun damage. A Patio Comfort heater is an infrared heater that emits warmth that feels as if you are being toasted by the sun itself. More importantly, the heater provides warmth to enclosed and open spaces in a safe, efficient, and convenient manner. Whether you're looking to host an outdoor dinner party or simply wanting to relax on the patio while sipping on a glass of wine, an infrared outdoor patio heater optimizes comfort and warmth. You will, of course, want to take your existing decor into consideration when choosing a finish for your patio heater. If you have lighter decor or outdoor stainless appliances, such as in an outdoor kitchen, then a heater with a stainless steel finish will make for a great choice. On the other hand, if you have darker decor, like dark furniture with wood accents, an antique bronze finish will complement your outdoor area. This finish is especially ideal if you have bronze statues sitting on your outdoor patio. This finish is especially ideal if you have bronze statues sitting on your outdoor patio. The Antique Bronze Polyurethane Powder Coating features a textured finish and the color is well-suited for outdoor entertaining areas. 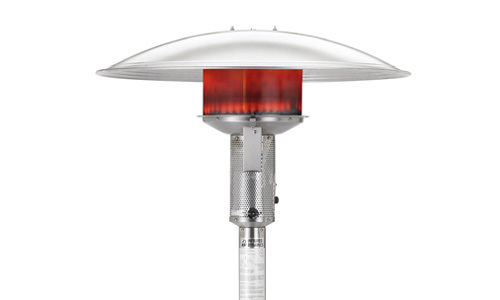 Propane powered heaters are the most popular type of patio heater sold in the US. And while most patio heaters are similar in their overall functionality and design, there are a few key characteristics of AEI heaters that help them stand apart from the competition. Did you know the Model NPC05-SS and Model NPC05-AB models both come with a natural gas hook-up/installation kit? Both also feature a heavy duty latch and a hood cover. Even better is that when used on the highest setting, the heaters will burn for up to 10 hours. That's a whole night of warmth to add to your outdoor patio area. When shopping for a patio propane heater, contact us find an authorized independent dealer that is closest to you. And don't forget that most heaters are available in various finishes, easily allowing you to choose a heater that complements your existing outdoor decor.